News Americas, NEW YORK, NY, Fri. Nov. 30, 2018: Here are the top headlines making news from across the Caribbean for today, Fri. Nov. 30, 2018. A Texas grand jury hearing the case of the Caribbean immigrant and St. Lucian native who was gunned down in his apartment by a Dallas cop, will return today, likely with a verdict. The grand jury began hearing the prosecution’s case Monday against 30-year-old former cop, Amber Guyger, who was arrested on a manslaughter charge Sept. 9, three days after killing Botham Shem Jean. She told authorities that she mistook his apartment for hers on the night of Sept. 6 and thought he was a burglar. The grand jury could do one of three things. They could either choose to indict Guyger on the manslaughter charge, indict her on a more serious charge, such as murder, or choose to not indict her on any charge (no bill) if they felt the evidence didn’t support the accusation. Jean’s family has filed a lawsuit against Guyger and the city of Dallas in the shooting. A Haitian man who was granted asylum but has been in US immigration detention for two years will finally be released. Ansly Damus, a teacher from Haiti who entered the U.S. in 2016 and sought asylum saying his life was at risk because he criticized a political leader, has been locked up in a windowless room at a jail in Chardon, Ohio, for two years. Judge Judith Levy said Thursday he will be freed after US officials agree to let release him pending his asylum appeal. Damus will, however, have to wear an ankle monitor and live with a couple in Cleveland Heights, Ohio. Former head of the Tourist Board in St. Maarten, Regina Labega along with Fabian Badejo and Erica Fortuno, were on Wednesday found guilty of embezzlement. Labega was sentenced to 12 months suspended sentence while she has to pay a fine of NAF.300,000,00. Badejo and Fortuno were convicted to 3 months suspended sentence while they each have to pay a fine of NAF. 50,000.00. All three suspects have a probation period of three years and have been banned from holding public office for a period of 5 years. ABOUT: News Americas Now News Network is a newswire covering the Americas – the Caribbean and Latin America and its Diasporas with syndication on Google News, Apple News, across 21 plus news sites including on the Caribbean Today in Florida, on Irie Jam radio in NYC and on Social Media – Facebook, Twitter, Instagram and Linked In. 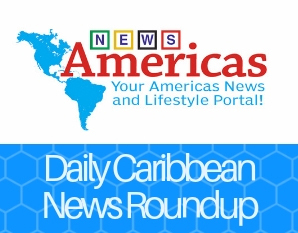 The post Caribbean News Roundup – Nov. 30, 2018 appeared first on Caribbean and Latin America Daily News.